When you’re planning a special event or a night out on the town, there’s	no shortage of guests and other people to move around. That’s why	hiring a bus from North Sydney Bus and Coach Charters can be a lifesaver. Our team is highly experienced in providing wedding shuttle services –	we provide transportation services for guests from church or ceremony	locations to the reception venue of your choice and return. In addition, we also provide minibuses for hire, which are perfect for	photo tours en route to the wedding ceremony and reception venues. 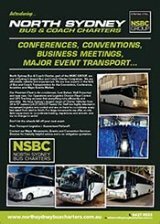 North Sydney Bus Charters also provides services for social outings, including	Hens and Bucks nights, birthdays and club and pub shuttles. We hope to make chartering a coach for your event an easy and pleasant	experience. Our staff can tailor your bus charter to any route and timetable. We recognise	the importance of punctuality on this special occasion and promise to	give your bus charter the extra level of attention that you deserve.